With ales e.g. Youngs and Doombar, a good selection of wine (I’m a particular fan of their medium house white, which at £3.75 is surprisingly affordable) and spirits, which are far too expensive really but then again this is London it’s normal fare when it comes to drinks. The food again is traditional pub grub such as burgers, scampi and pies, but their specials board appears to change each week. 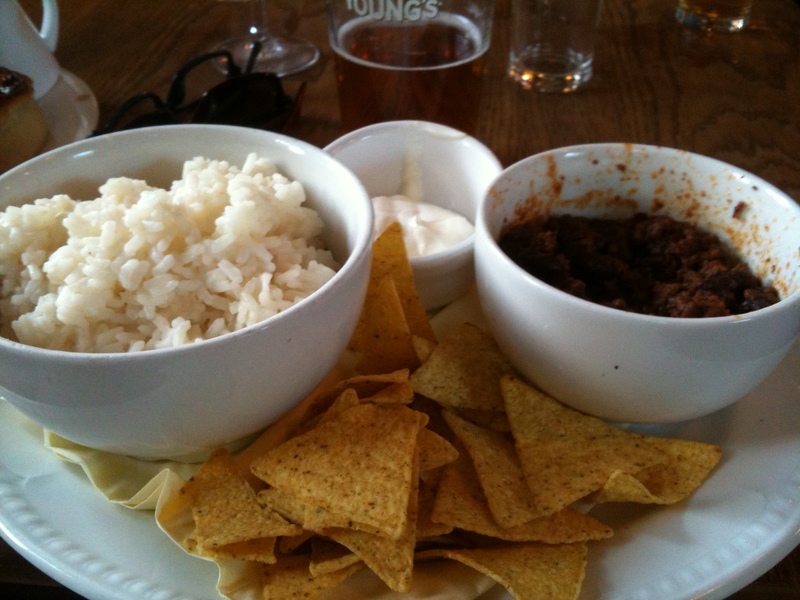 The week that we visited had Thai curry and chilli con carne on offer. You order at the bar and the food arrives in about 30 minutes, although I guess it depends on how busy the pub is (warning: nights when there are gigs on at Brixton Academy and the Thursday pub quiz night are particularly busy). 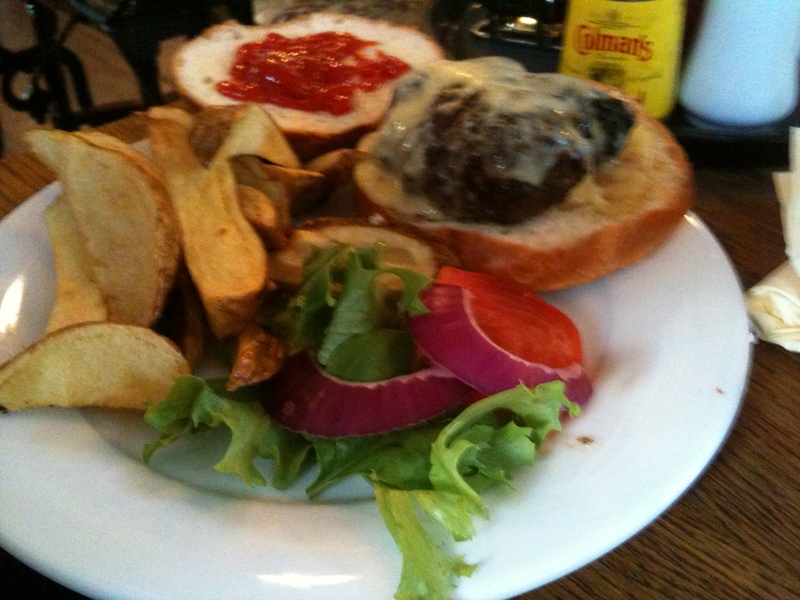 We went for a burger with Montery Jack cheese, scampi and wedges, chilli con carne and the selection of pies. To be honest if you were to compare the food to places in Brixton Village and the surrounding area (Ichiban and Courtesan for example) of course this wouldn’t beat them out, but this is a pub and this is pub food, you get what you expect. Highlights for us were the potato wedges which were spiced with cumin and paprika and served with sour cream and the burger which was juicy and hit the spot. The selection of pies and chilli were also favourable. Food came to about £30 and of course drinks are usual London pub prices. On the Friday night that we ate there we had just come back from holiday so were at a lost with an empty fridge, so a meal at the Trinity Arms and a couple of pints put everything right. Haven’t had a chance to try their Sunday lunch yet, although it is only a matter of time. 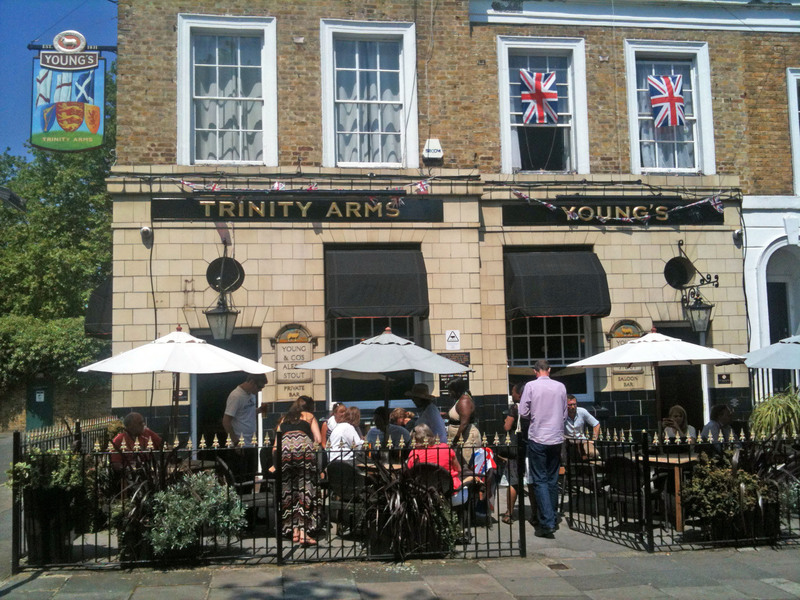 We couldn’t imagine ever not going to the Trinity Arms, not only do we see our neighbours and close friends there, but the staff are always welcoming (although seem to change around a lot!) and the pub garden is one of my favourites. DISCLAIMER: The Trinity Arms has been our local pub for as long as I can remember so feel this may be a slightly biased review!